Multipurpose Cellini vase in Carrara marble. Perfect for garden or home decor. Multipurpose Hydria vase in crema marfil marble. Perfect for garden or home decor. 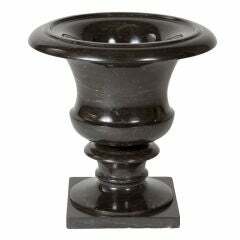 Multi-purpose Bernini vase in Nero Marquina marble. Perfect for garden or home decor. 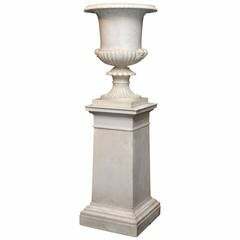 Multi-purpose Antiqua urn in crema marfil marble. Perfect for garden or home decor. Multi-purpose Agora urn in crema marfil marble. Perfect for garden or home decor. 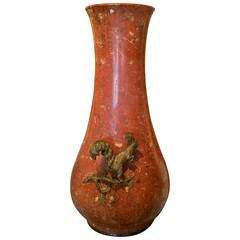 Speciman marble turned 'dinos' shaped vase, circa 1830. The marble is speckled and veined with red and white. 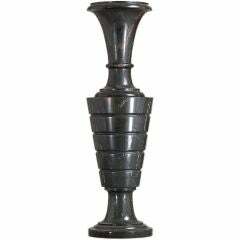 Mid-Century polished black marble urn of classic form.<br /> Base measures 7"w x 7"l.
18th/19th century Grand Tour Amphora vase on hand wrought iron tripod base. Vase on base stands 44.5" high. A large and important 19th century Italian Carrara marble urn on original marble stand. With a very fine detailed finish. The urn has partly a polished surface. 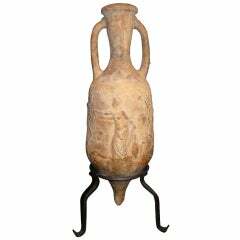 Very nice zinc Medici vase with old color, France, circa 1850. Weathered. 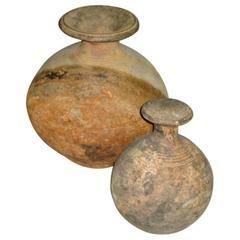 Two ancient terra cotta pottery vessels, Urns or Vases from the Khmer region of South East Asia. Sober forms that provides a complement to a Mid-Century or modern environment.